A few weeks ago my wife and I were invited to join four friends for Sunday lunch. Our host has a south-facing dining room with a glitter ball sitting in the window. We were all entertained by the light beams gradually moving around the walls and ceiling. I suggested that a small solar cell and motor attached to the glitterball might improve the entertainment. I bought these parts from Maplin soon after at a cost of £3.60. 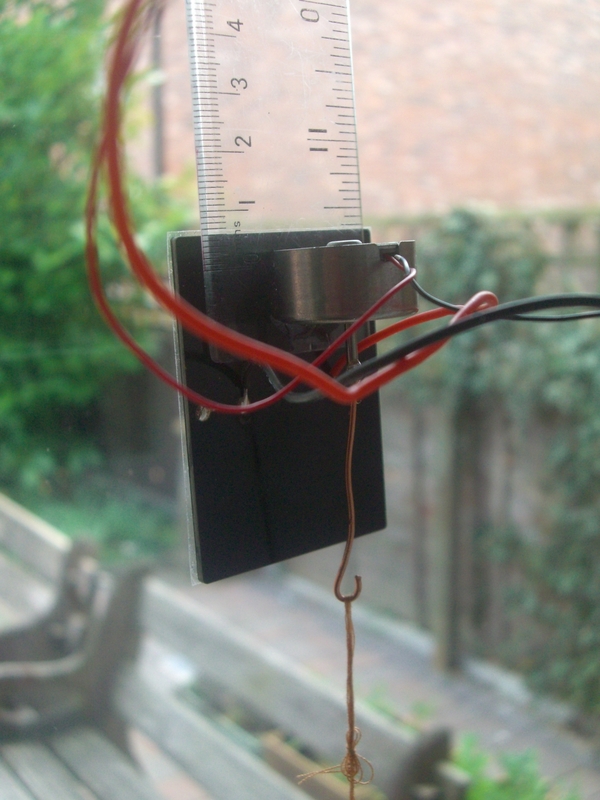 I glued the motor and cell to a spare ruler to which I also glued a strong copper wire to attach all to the ceiling. I have this running in our garden room. It rotates too fast and I need to add a resistor. Whether our friend will want this clutter with her glitter ball I have yet to find out. I await her next visit here before further changes. This entry was posted in Uncategorized on April 27, 2015 by libbymiller.